* [New] Bin\asmgrub.exe, Bin\msdc.exe. Please refer to Doc\ReadME_*.txt for detailed information and usage. * [New] Avlsys - Aero Menu File Browser. Please refer to Doc\ReadME_Avlsys.txt for detailed information and usage. airoot (hd0,0)/airboot/ * note the last "/". ！！ This aero.sys will be the final version based on the lagency Grub. Next will be Grub2 Based. By using Aero Studio, you can use any favorite images as the menu background; by using the 'Button Control', 'Picture Control', 'Static Control' and the 'Progress Control', you can design the menu more profession. And these designations, you could deploy them to any partition, or the MBR(s), or the iso images. So that, it makes you get things done easier and faster! Aero supports not only the Bootsectors, FDD-Image, HDD-Image - even using gz/zip compressed - to start your PC, but also the ISO-Image. Png/Gif/Bmp/Jpg/Tga are all supported. When you design within the Aero Studio, you may feel using a WYSWYG web designer - simple and efficient. When you generate the Aero menu, it will automatically generate the right images to display at runtime. If you want to preview the design or share your idea with your friends, the "Export to web" makes you achieve this faster and easier. Aero Studio can dynamically generate the command line to test you designation using the build-in qemu. * design the menu item: you can use 'button control', 'picture control', and 'static control' as a menu item, and set its propertities, including the command lines. * using media to test in a virtual machine. * if everything is OK, great job has been done! Wish you like it, and enjoy! Looks great from the picture. First impression about the two things you offer for download. *Real* 1st release for English Users, and with mui support. Im guessing this is the one youre mentioning on your second post. What is this. It has no description. Im guessing to build your UI interface for bootup. And do we need both in order to make things work? For a first release. It looks great. but link does not work. appear to install the "Aero Studio 2007"
A video Tutorials would be another way to go also. There is some example menus included. Just select Open from the file menu. Could not work out what you do next though. I'v corrected the .zip download error. It's my fault. and the .exe package is a win32 install distribution, and .zip package is a plain package - they all are work fine. I was refering to this line for the exe package you offer. This is in youre second post. At first I was trying to figure out wether we needed both files or just one but youre new post mentions that they are both the same. So I understand now that they are both the same just distributed as an exe and a zip because some companies or businesses will not allow the download of exe. They will allow the download of zip files. Here is my interpretation of your setup information text. Please feel free to use it. By using Aero Studio one can select customized images as a menu background. Using elements such as &#34;Button Control&#34;, &#34;Picture Control&#34;, &#34;Static Control&#34; and &#34;Progress Control&#34; designing professional looking menus is a snap. 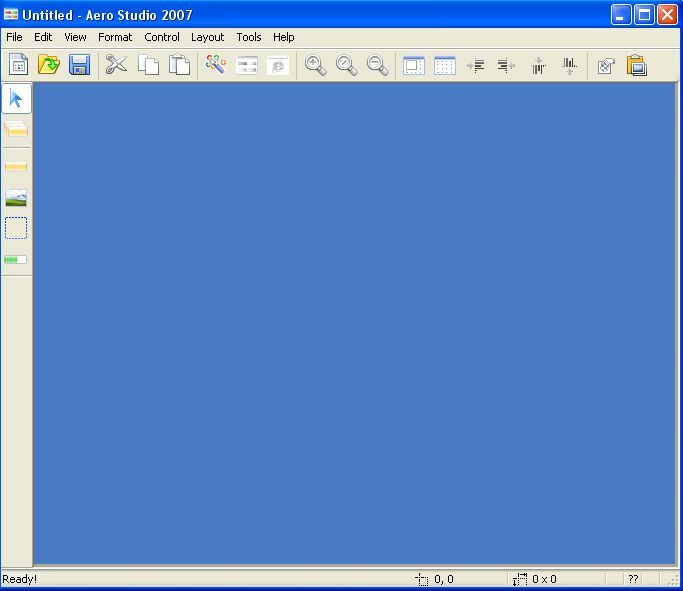 Aero Studio tools can deploy to partitions, MBRs or ISO images. Building custom boot discs just got easier and faster! Aero Studio supports not only boot sector but also FDD, HDD &#40;even using gz/zip compressed&#41; and ISO images. Supported image formats include PNG, GIF, BMP, JPG and TGA. Designing within the Aero Studio feels like a WYSIWYG web page editor - simple and efficient. When you generate the menu it will automatically create the right images to display at runtime. The &#34;Export to Web&#34; function makes it quick and easy to preview designs or share ideas with colleagues. Aero Studio can dynamically generate the command-line parameters to test your design using the included QEMU PC Emulator. thanks! i will correct my document in the next release. Well, since it was written by Chinese programmers, that's quite normal. Before you rejoy too much, isoemu cannot boot NT based OS in the .iso. You mean I can't make a WinPE ISO and boot it with ISOEmu? The problem is always the same, the "switching" of drivers when a NT system boots. Had finally a good reason to use Aero Studio but there's no documentation available to explain how to get started? useronce / gandalf: Would you please write a small tutorial explaining how your program works? I like the UI and the ease of use but nothing beats reading the docs to know in detail what to do and how to apply it in good use. my post is very outdated, but I wonder if somebody has found a help tutorial for this tool. For now, it only has tutorial in chinese. Hope english tutorial will be added in upcoming new version . some nees to be ideal. i understand that how to work by this program,and i am going to write a tutorial to use it.this will take 2 or 3 days .so wait for me. I am sorry ,i had a mistake in last post and i uploaded part 2 two times. Hi shirin, thank you for the tutorial. If you don't mind, I will move your topic to the tutorials section. i am 53 years old from iran . thank you that you want to move my tutor to tutoial section. Hi again Shirin, you can call me nuno! I will move your tutorial now. After searching for a GUI for Multiboot CD i found this Forum. AeroStudio 2007 looks very well and i want to use ist for my Multiboot CD. But i can't find the english version of the Programm. I found a link in a other forum, but it is only in chinese charset. Where can i find the english version? Really odd but it seems their site is down. Ill upload a back up of the Enlgish version. Hope! they come back up. there is a way to insert a iso created with bartpe based on XP in aerostudio?